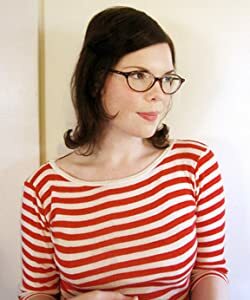 Emily Winfield Martin makes paintings, books & etceteras. She works in a tiny nook of a studio filled with treasures & old wind-up toys. Her work is inspired by fairy tales, music, myths, illustration from the late 19th through mid 20th century, her favorite films, and the natural world. She likes sea monsters and seashell-colored poppies & lives among the giant fir trees of Portland, OR. CLICK HERE FOR MORE STORIES BY EMILY WINFIELD MARTIN. Snow & Rose: Into the woods… Who knows what may be lurking? 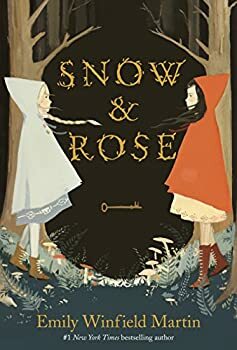 Snow & Rose (2017) is a charming middle grade level retelling of the Snow-White and Rose-Red fairy tale with illustrations by the author, Emily Winfield Martin. Rose and Snow are the beloved eleven and nine year old daughters of a nobleman and his commoner wife, a sculptor. Rose has black hair and rosy cheeks, and is patient and gentle; Snow has white-blonde hair and icy blue eyes, and has a wilder and more adventurous personality. They have a fat grey tabby cat called Earl Grey (I adore that name! I want to adopt a grey cat now and name him Earl Grey) and had a large house with servants, a library with shelves that reached the ceiling, and a spectacular garden, half white flowers and half red, in honor of the two girls.